Between Stitches: just chuffed to bits! 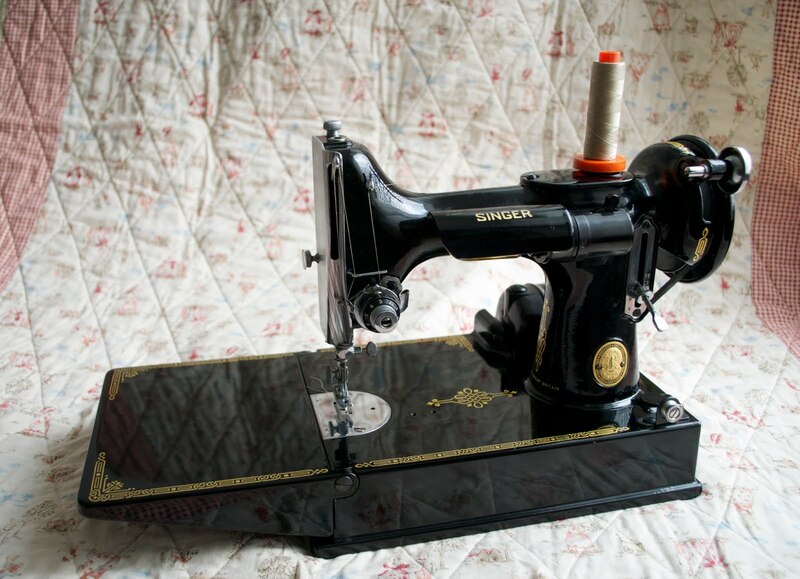 May I introduce you to my new Singer Featherweight? No romantic story here, it came to me from England purchased from eBay and I find myself very fortunate to have one in such nice condition. This one is from 1952. Found under Grandmothers' bed. Shiny and clean on the outside, and just as pristine on the inside. It's clear to see it was barely used. I gave it some oil, lubed the gears, and now it's just purring away. Although I do enjoy using my two Pfaffs, this is a different piece of pie. I understand now why quilters around the world love this little machine and take it with them everywhere they want to sew. I love it's simplicity, and the fact that it's so easy to maintain. I may love my high-tech gadgets, but there's nothing like good old-fashioned mechanics! You do understand when I tell you that in my enthusiasm I've made a little quilt with it ( soon to be posted ) , rather than properly photograph and post to my blog....hey, I was having too much fun! So for me, "Grasshopper". What do you think? It's the only thing that came to mind because it is so small and cute...you almost want to knit it a sweater...lol! I named my featherweight after my friend, Jeanne, who left her machine to me in her will. Even though she left hers outside on her covered patio in Florida and it shows the wear of the weather, I adore this machine. I think of Jeanne ever time I sew. Grasshopper is just lovely. My grandmother had one very similar to this, perhaps a bit older. I have my mother's 1959 and my own 1972. All very "low-tech", but just perfect for me. I loved reading about your new sewing machine! What a great find!!!!! I know you are having a grand time with it. Congrats on a wonderful find! I'm a Bernina user at home but I love taking my featherweight to classes!!! I've had mine since I was eleven! I think Grasshopper is a fantastic name, I have never named mine - I'll have to think on it and come up with a nice name for it! Congratulations! Oh I am so jealous! Love it. wat is het toch een poepie zeg ik ben zo blij dat ik er ook een heb (hihihi) groetjes janine.